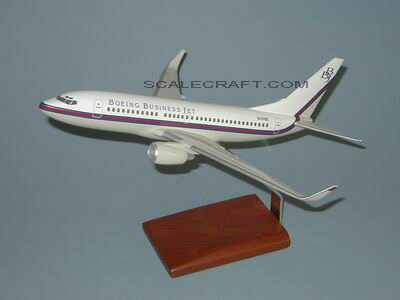 Boeing Business Jets is a joint venture formed by Boeing and General Electric in July 1996 to develop and market a corporate version of the popular 737 airliner, initially focusing on the 737-700 based BBJ (or 737-700 BBJ). The first BBJ rolled out from Boeing's Renton plant on August 11 1998 and flew for the first time on September 4 that year. On October 30 the US FAA awarded certification to the developed 737-700 airframe on which the BBJ is based. The first completed BBJ was delivered on September 4 1999. Solid Resin. Scale: 1/100. Wingspan 13 1/2 inches, Length 14 inches.